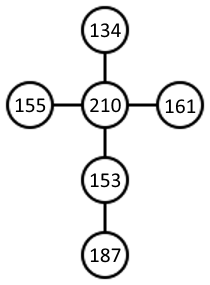 Find six positive natural numbers, not necessarily distinct, whose sum is 1000 and which, if placed appropriately on the vertices of the following graph, two of them will be joined by an edge if and only if they have a common divisor greater than 1 (that is, they are not relatively prime). Find the solutions in which the product of the six numbers is as small and large as possible. To get a small product we want one large number and lots of small numbers. Conversely, to get a large product we want all the numbers to be close to $1000/6=166.66\dots$ I used this to reduce the search space. Since it wasn't a full search it's always possible I missed better solutions. Not the answer you're looking for? 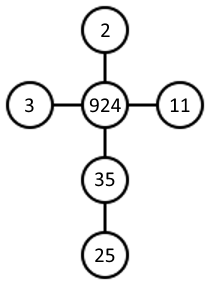 Browse other questions tagged computer-puzzle number-theory graph-theory or ask your own question.